How come something like this isn't commercial yet? Beeks just don't care? Seems like you would spend less time seeing which hives where stronger and which where weaker? OK, help me with this. We all know the bees don't build the hives evenly. If you lift each side, each may have a different 'weight' or take more force to lift. How does this give you an accurate weight of the hive? you lift the bottom board up which take the entire weight. ...except for that being supported by the opposite edge, where the hinge is. You could simply lift one side and then inspect the hive for year first year or two. 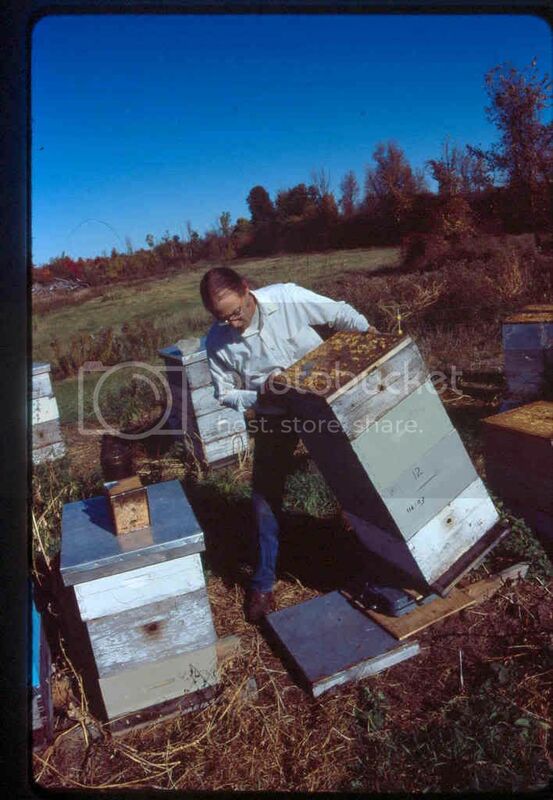 After gaining that experience, simply lifting the one side of the hive will tell you almost as much as the scale. He has used simple levers. It is all about proportions. When you put the hinge on one side and lift, you get a weight. If you make the lever twice as long, you lift half the weight. People have been weighing hives for probably a century by lifting one side with a mechinisim that weighs the hive. I have read about them in some book(s) and have seen pictures. Well, looks a bit like overkill to me. I've been weighing hives for years, and only need this scale and a piece of plywood. No lifting. No permanent boards under each hive. Cheap. But then, some folks just love gadgets. Mike, do you just weigh "the edge" or do you somehow rest the entire bottom on your scale? Are those scanned Kodachrome slides? Some love the gadgets, but inflation will catch up with you....those utility scales are now around $100, at least according to the google shopping thing. I have started using the method suggested by Michael Palmer. 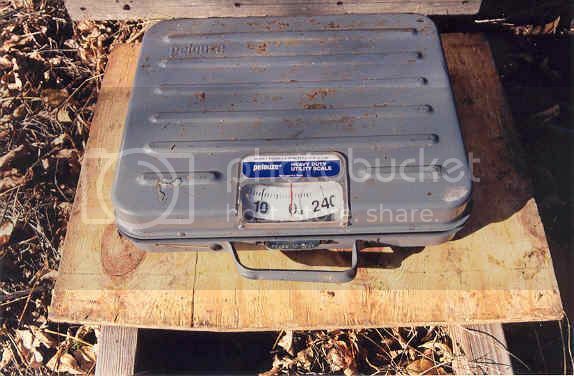 Instead of a package scale, I bought a dial type bathroom scale (digital scales are difficult or impossible to read outdoors). You need to tilt the hive until it balances on the scale and you are not supporting any (or very little) of the weight. 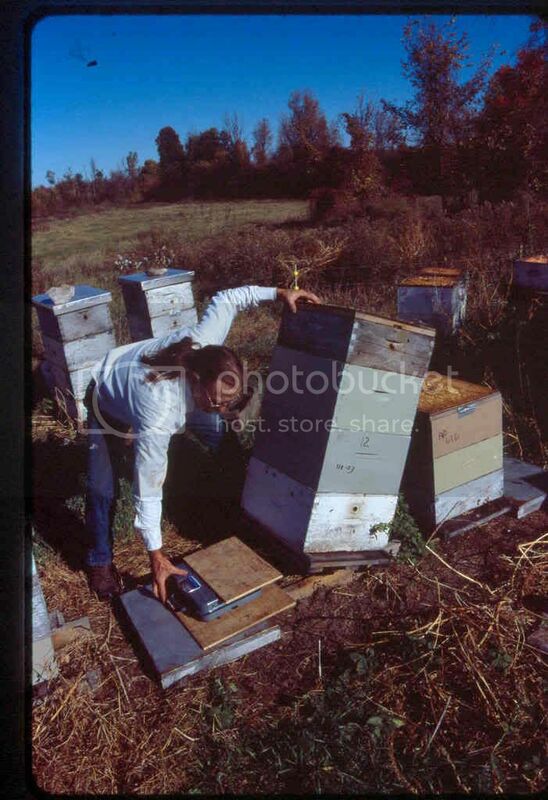 I also strap or tie the hive to make sure the boxes do not separate. i stepped on a digi today , it said fat . At least yours will talk to you. Mine just groaned and the display went out. Tip the hive up onto the scale and balance on the edge of the bottom board. After hearing about Mikes technique I picked up one of those Pelouze scales on Ebay for $19. Rugged little bugger. Raising Vermont Bees one mistake at a time. If I tried to check the weight of my honey I'd get a black eye. Used a cotton scale, a 2x4, motorcycle strap, and a step ladder to pick hives up and weigh them one by one. It worked but I think the tipping it way is faster. The scale has a simple "peak weight" slide indicator - reset between each use. A "grab hook" on the scale eliminates the need for the eye hooks. Very fast, accurate, & efficient. Last edited by Colobee; 04-01-2016 at 07:42 PM. After 40 years of beekeeping, I've come to realize that the bees can fix most of my mistakes. I'm working on an electronic design using load cells at each corner. It will be part of the bottom board. Weights are stored at interval allowing findings such as what time the hive begins active foraging (maybe to compare activity at two locations), compare weight day to day so buildup can be seen, or die off noticed to catch a diseased hive. We'll see if it's worth the trouble.